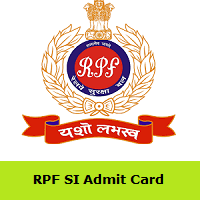 RPF SI Admit Card 2019 is released for Group F PET, PMT, and DV Test. The RPF SI PMT, PET & DV Call Letter 2019 is released by Railway Protection Force (RPF) authority on 7th February 2019. At the bottom of this page, we attached the direct link to download the RPF SI PMT, PET & DV Call Letter through online. Moreover, candidates who are interested to download the RPF Sub Inspector Admit Card 2019, they have to check this page. The Railway Protection Force (RPF) announced 1120 Sub Inspector Posts and this is the right place to know the complete information related to RPF SI Admit Card 2019. The higher authority is planning to conduct the Physical Efficiency Test (PET) and Physical Measurement Test (PMT) in the Last week of February 2019. For this purpose, the officials already released the Admit Card at the official site. For the sake of job seekers, we furnish steps to download the Call Letter. Candidates download the RPF SI Admit Card 2019 through online only. Job hunters who are willing to participate in RPF Sub Inspector PMT, PET & DV, they need to download the admit card. Job hunters download the RPF SI Admit Card 2019 through indianrailways.gov.in. By downloading the admit card, participants have to enter the necessary details such as Registration Number, Date of Birth and Password. Contenders may face huge problems to download the hall ticket. Therefore, we provide a direct link to download the hall ticket. So candidates bookmark this web page to know the upcoming details. And the hall ticket is available in the official portal 10 days before the exam. Therefore, applicants use this opportunity and download the admit card as early as possible. Aspirants who are anxious about downloading the RPF SI Admit Card 2019, they can check this article. Every year Railway Protection Force (RPF) is conducting recruitment for various posts. And now higher authorities publish the notification for Sub Inspector job vacancies. Moreover, there is a heavy competition to download the hall ticket through online. Therefore, applicants collect the admit card as soon as possible. Furthermore, candidates who are curious about attending for RPF Sub Inspector Written Test, they need to download the RPF SI Admit Card 2019. In case, aspirants forget to download the admit card, they couldn’t have a chance to attend the exam. Therefore, download the RPF Sub Inspector PMT, PET & DV Admit Card 2019 and get ready for the written test. Participants need to check the complete information appeared on the hall ticket. If the details are invalid, they are not allowed the exam hall. Job seekers need to verify the details such as Name of the Candidate, Signature, Hall Ticket Number, etc. To make easy to the candidates, we provide a list of details appeared on the hall ticket. Therefore, aspirants verify the list and rectify the mistakes with the help of the Railway Protection Force (RPF) before the exam. In case aspirants are interested to get a job in Railway Protection Force (RPF), they can start the application process from 1st June 2019 to 30th June 2019. RPF SI Admit Card 2019 plays a vital role during the test. Because examiners did not allow the applicants without having the hall ticket. Moreover, contenders who successfully applied for RPF Sub Inspector Post, they have to download the admit card. During the examination, job hunters should take the hard copy of hall ticket and is proof to the examination. And also participants have to check the details printed on the hall ticket and identity proof. Furthermore, candidates who applied for RPF Sub Inspect post, they able to download the RPF SI Admit Card 2019. Therefore, participants don’t miss this opportunity and collect the hall ticket through online. Moreover, we furnish procedure to download the hall ticket. Therefore, follow the step by step process and collect the admit card before the written test. And job seekers can follow our portal that is Sarkari Naukri to know the latest information regarding Results, Syllabus, Previous Papers, Recruitments, etc. Aspirants should visit the official portal of Railway Protection Force (RPF) that is indianrailways.gov.in. Now contenders search the RPF SI Admit Card 2019 on the home page. Tab on the RPF SI Hall Ticket 2019 link. The login id has appeared on the screen. Fill the login id with appropriate details like Registration Number, Date of Birth and Password. Download the RPF Sub Inspector Admit Card 2019 and take a print out for further purpose. The data arranged in the above article is helpful to all the candidates who applied for RPF Sub Inspector Post. In the above web page, we provide information related to admit card available date, date of the exam, steps to download the hall ticket. And also we attached the direct link to download the RPF SI Admit Card 2019. Therefore, participants don’t miss this opportunity and download the hall ticket. Moreover, job seekers download the admit card and participate in the RPF Sub Inspector PMT, PET & DV Test without any disturbance. And also applicants can share this article with the candidates who enrolled for RPF Sub Inspector Post.